This kit explores the effect restriction enzymes have on DNA. Restriction enzymes, one of the primary tools in molecular biology, cut DNA molecules into precise fragments of a predictable size. Students can see the results by digesting lambda DNA with restriction enzymes Pvu II and EcoR I, running a gel, and then determining the base pair size of each fragment. The kit includes a teacher’s guide, a student copymaster, and enough materials to run eight gels. 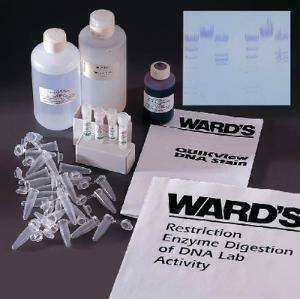 Ordering information: This kit contains bottle of 0.8% agarose, 200 mL; bottle of 5X TBE running buffer; concentrate, 500 mL; bottle of Ward’s QUIKView DNA stain concentrate, 60 mL; tube of Ethidium Bromide stain concentrate, 50 ?L; biohazard bag; microfuge tubes; gel staining trays; loading dye, 0.5 mL; coupon redeemable for: 80 ?L of Lambda DNA/Hind III; 3x80?L uncut Lambda DNA; 50?L of EcoR I restriction enzyme; 50?L of Pvu II restriction enzyme; 50 ?L of 10X EcoR I reaction buffer; and 50 ?L of 10X Pvu II reaction buffer. Materials needed but not provided are Electrophoresis chamber; Power supply; Incubator or hot water bath; micropipettes; metric ruler; permanent marker; calculator; gloves; goggles; apron UV Transilluminator; and UV goggles.